The highlight will obviously be the functionality that’ll allow you to create your WooCommerce product feed and upload it directly from your WordPress to Google Merchant Center. The team at ExportFeed has gone through numerous discussions about the implementation of this feature, has gone through rigorous testing and will still perform some more optimizations and testings before bringing this feature in the market. How will the WooCommerce to Google Merchant direct upload work? After installing the plugin, you will have the option to either directly upload your product feed to Google or to save it as a file and then upload it to Google manually. When you choose the first option – the latest feature, you can create the product feed as you would normally and finally hit an Upload to Google button. The connection part with Google is important! This will be a one-time connection that you can either set-up when you start creating your product feed or you’ll also have the option to set-up after you have created your product feed. 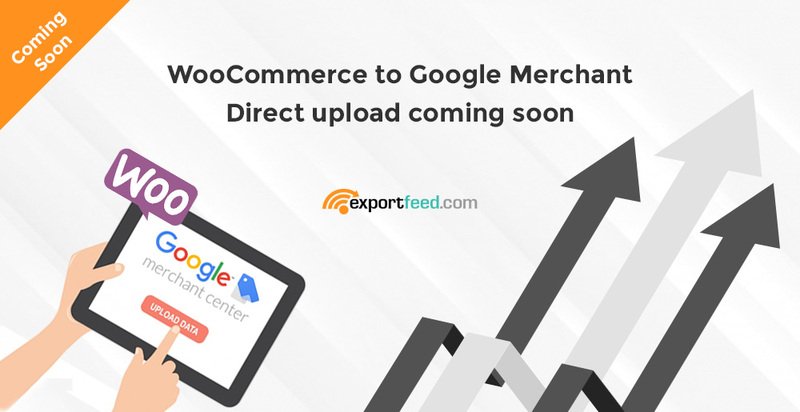 Once you connect your version of ExportFeed for Google Merchant plugin, you will then be able to upload your product feeds directly, without having to log in to your merchant center over an again. What more with the latest release of the Google plugin? This plugin will also fetch the results of your uploads and display you the Google Merchant Center reports inside your WordPress admin – no more need to login to your Google Merchant Center for reports anymore. Along with that, you’ll also have the option to correct any errors that you may get through the Google product feed upload reports.